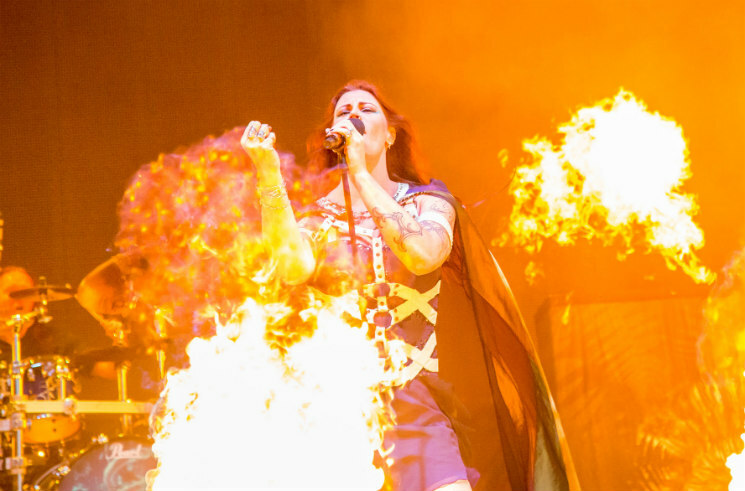 Finnish symphonic metal titans Nightwish performed at the Heavy Stage of Heavy Montreal on Saturday night (August 6) to a rapt crowd of thousands. The intricate music is centered on the lush vocals of raven-haired frontwoman Floor Jansen, while her five band mates surround her with a bouncing, soaring construct of interwoven synthesizer, crisp guitar riffs and ample variety of percussion and wind instruments. The band were grandly introduced on the PA by "Roll Tide" by composer Hans Zimmer before bursting onto the stage. Amid vast pyrotechnics that swept the stage during the entire set, the band leapt into a soaring rendition of "Shudder Before the Beautiful," from their 2015 album Endless Forms Most Beautiful. The song follows a very common formula for Nightwish, and for many symphonic metal bands for that matter: Epic, powerful, prowling synthesizer sequences and drumming eventually collided with crisp electric rhythm guitar riffs that galloped alongside each other for a while before subsiding slightly and letting the vocals take the forefront. This was the case for the first song as it was for the majority of the set, and it's a good thing too — it works incredibly well live and on this night provided an epic sound. Having 75 minutes at their disposal and a vast catalogue of nearly 20 years to select from, the band spiralled through a sonic journey that covered the majority of their albums. It was particularly captivating to hear the songs that best balanced the symphonic elements, the heavier guitar riffs and Jansen's breathtaking vocals; perfect examples were "Sahara" from 2007's Dark Passion Play and the 2001 Imaginaerum opus "Last Ride of the Day." Every song was so terrific that it was hard to say whether any one thing really stood out, but if there was an exceptional performance, perhaps it was the haunting "The Greatest Show on Earth," from their latest album. European metal always seems to have a special place in the hearts of Montreal metal fans, and it was as evident as ever for this majestic Nightwish performance.